All research partners are in an intensive exchange, be it through regular face-to-face meetings, telephone conferences or bilateral conversations. So far, we have been quite successful – after 18 months at halftime, our partners have already developed numerous research results (see papers) and presented them to the first pilots. We have discussed many challenges, found solutions or left it open so far. Now the PrEstoCloud team has expanded its research collaboration and dared to look beyond the horizon: How do consortia of research projects with related topics proceed? Of course, we’re talking at conferences and fairs. But why don’t we take the time to get to know another project a little better? We wanted to get out of the PrEstoCloud house and exchange ideas with other consortia. The idea for a common workshop with I-BiDaaS was born. Software AG, partner in both consortia, initiated a meeting in Athens. 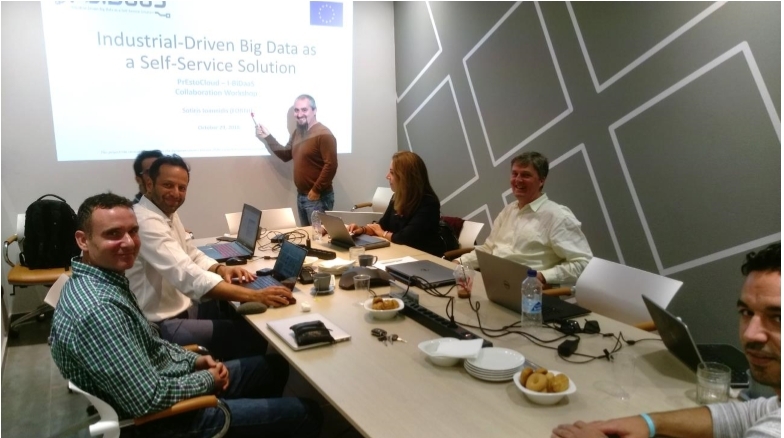 Last month, the two H2020 projects PreEstoCloud, and I-BiDaaS met in the premises of Ubitech, which is a partner in the PrestoCloud consortium. I-BiDaas stands for Industrial-Driven Big Data as a Self-Service Solution and aims to empower IT and non-IT big data experts to easily utilize and interact with big data technologies. I-BiDaaS is proposing a unified solution that significantly increases the speed of data analysis and facilitates cross-domain data-flow towards a thriving data-driven EU economy. The project started on January 1, 2018 and the Minimum Viable Product is planned for Month 12. The main focus of the project is to design a self-service solution that empowers users to easily utilize and interact with big data technologies. Of course the first meeting was about getting to know each other with general presentations. which offer the opportunity to collaborate. Since the PrEstoCloud project started one year earlier than I-BiDaaS, many of the technical aspects are designed now and prototypical implementations are available. Many useful hints regarding edge and streaming analytics were shared and helpful products discussed like Tosca, FaaS paradigm, JPPF framework and lemonade (see e.g. www.lemonade.org.br). What did we learn? There are so many forms of research collaborations. And with the workshop we explored new paths as a great opportunity to collaborate on many aspects and ensure greater impact by leveraging each other’s communities and results. We are curious how the cooperation will develop further. Stay tuned.